This calculator will calculate an asset's depreciation expense based on its acquisition cost, salvage value, and expected useful life. Plus, the calculator also calculates first and final year depreciation expenses in cases where the asset is placed in service for a partial first year. Finally, the calculator also gives you the option to include a year-by-year depreciation schedule in the results -- along with a button to open the schedule in a printer friendly window. Note that if you would like to calculate double declining depreciation (DDB), please visit the DDB Calculator. 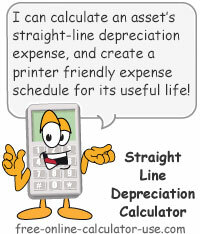 Calculate straight line depreciation for the first, final, and interim years of an asset's useful life. If you would like the name of the asset, or General Asset Account (GAA) included in the title of the depreciation schedule, enter the name in this field. Enter the total cost to acquire the asset, or the adjusted basis, whichever is the lesser amount (without dollar sign or any commas). If you are adjusting the depreciation schedule for over or under-reporting depreciation in prior years, enter the remaining depreciable base. Enter the expected salvage value (also known as residual value) of the asset at the end of its useful life. Enter without dollar sign or any commas. If you expect the asset to be worthless at the end of its useful life, enter a zero. If you placed the asset in service mid-year, enter the number of months that were remaining in year. Otherwise, if the asset was in service the entire first year, enter 12. If you would like the year included in the depreciation schedule, enter the 4-digit year that the asset was placed in service. Leaving this field blank will simply number the years (1, 2, 3, etc.). This is the prorated depreciation expense for the first year the asset was placed in service. This is the annual depreciation that will be expensed in the years between the first and final year of service. This is the depreciation that can be expensed for the asset in its final year of service. Enter the asset's useful life in the number of years. If put in service mid-year, enter the number of months remaining in the year. Optional: Enter the 4-digit year the asset was placed in service. Click the "Calculate SL Depreciation" button and scroll down to see the results, which will include a button for creating a "Printer Friendly Schedule". What depreciation is, what the straight line method is, and how to calculate it. Depreciation is the reduction in value of an asset that occurs with time and use, where the asset's value is expected to last more than one year, but not last forever (land is not considered to be a depreciable asset). When you exchange cash for an asset, no immediate expense occurs because theoretically, you are simply exchanging one equal-valued asset for another. For example, if you were to exchange $10,000 cash for a machine valued at $10,000, theoretically you could immediately sell the machine for $10,000 without any loss. However, if you were to use the machine in your business for a period of years before reselling, obviously the amount you could sell the machine for (salvage value) would be less than what you paid for it. And it's this difference (drop in value) between what you paid for the machine and what you end up selling it for that is the machine's actual depreciation expense. Of course, since the machine's depreciation expense occurs over the span of two or more tax years, you need a systematic way to expense a portion of each year's depreciation to each tax year the machine is in service. While there are numerous methods for distributing an asset's depreciation expense over the course of its useful life, one of the most popular methods is called the Straight Line Depreciation Method (SLD) -- which, as the name implies, distributes the expense equally for each year of an asset's useful life. To calculate an asset's straight-line depreciation expense, you first take the asset's acquisition cost and subtract the amount you think you could sell the asset for at the end of its useful life (salvage or residual value). The result is what is referred to as the asset's depreciable base. Next, you divide the asset's depreciable base by the number of years you expect the asset to last. The result is the asset's annual depreciation expense. The exception to the above is if the asset is first placed in service at any other time than at the beginning of the year. If that is the case, then the first year's depreciation expense is prorated based on what percentage of the year the asset was in service. Then, the remainder of the first year's partial depreciation expense is assigned to the final year of the assets useful life -- as shown in the example below. Referring to back to the machine example discussed earlier, if you expect the $10,000 machine to last for 9 years, with a salvage value of $1,000.00, and you place the machine in service in April of 2012, here is how you would calculate the straight line depreciation expense for the applicable years. Step 4: .75 x $1,000 annual expense = $750 depreciation expense for year #1. Step 5: $1,000 annual expense - $750 depreciation expense for year #1 = $250 depreciation expense for year #10. In the last line of the depreciation schedule, you will note that the accumulated depreciation ($9,000) and the salvage value ($1,000) add up to the original cost of the machine. In my 30-plus years of being a small business owner, I have seen a lot of small business start-ups fail simply because the small business owners had no formal knowledge of accrual-based accounting. In turn, this caused the owners to mistake excess cash as being spendable profit. Of course, if a small business owner continues to spend profits that don't actually exist, eventually the business runs out of operating capital and fails. And one of the most common causes for a small business running out of operating capital is the failure to set aside depreciation expenses as they accrue. Using the $10,000 machine example, just because you are not writing a $1,000 check for the machine's depreciation on an annual basis, does not mean you have an extra $1,000 to spend. It means that you should be setting $1,000 aside each year so you can replace the machine at the end of its useful life -- without dipping into your operating capital.